For its latest Top 20 NYC Digital Agencies Report, the B2B ratings and review authority, Agency Spotter ranked over 300 digital marketing agencies in the New York Metro Area based on verified client reviews, credentials, focus areas, related expertise, and project work. 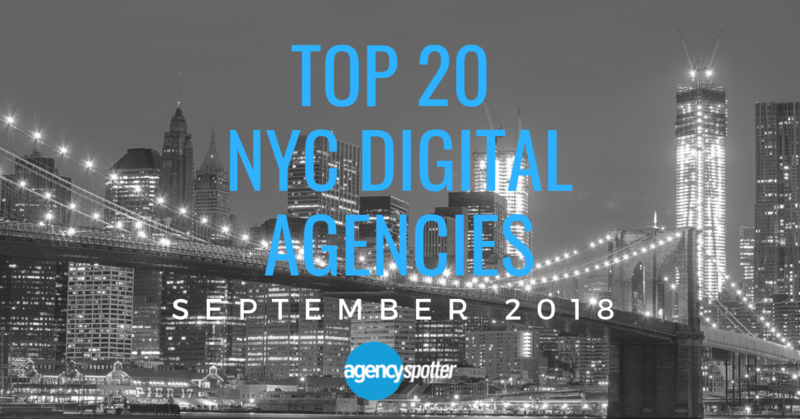 NEW YORK, September 25, 2018	(Newswire.com) - Agency Spotter releases the Top 20 NYC Digital Agencies Report for September 2018. The report features the 20 best digital marketing agencies in New York out of hundreds of other local digital agencies on their website, www.agencyspotter.com. These top New York digital agencies work with some of the most prominent, established companies including Disney, Nissan, Bose, Calvin Klein, and Verizon. I enjoyed working with [Ruckus] because they took the time to get to know who we were. They took the time to get to know where my heart was and where my passion was, and then they looked at our business and they said, you know, how do you guys view yourselves? And then they looked at the world and they said, how does the world look at you? It really gave us a great perspective on how we wanted to present ourselves, so we were able to craft an image of ourselves with Ruckus that I think accurately reflects who we are. Ruckus Marketing placed first on September's Top 20 NYC Digital Agencies report. This full-service agency believes in working "smarter, not louder" and helped brands grow in consumer engagement and action which delivered results. Ruckus Marketing is a consistent performer on Agency Spotter's top agencies lists with several five-star ratings in client reviews. David Robinson, Co-Founder at Admiral Capital Group states, "I enjoyed working with [Ruckus] because they took the time to get to know who we were. They took the time to get to know where my heart was and where my passion was, and then they looked at our business and they said, you know, how do you guys view yourselves? And then they looked at the world and they said, how does the world look at you? It really gave us a great perspective on how we wanted to present ourselves, so we were able to craft an image of ourselves with Ruckus that I think accurately reflects who we are." Ruckus Marketing has experience in various fields from enterprise to startup, along with companies such as Porsche, Harley-Davidson, Mobileye, and American Exchange. Bigbuzz Marketing Group earned the number two spot on this Top New York Digital Agency Report. Clients raved about the agency's creativity, and the account staff's attention to detail and timeliness with each project. Some of their clients include Garanimals, HBO, Honeywell, and Nikon. Explore the full Top 20 NYC Digital Agencies Report, including verified client reviews, project work, and more. Learn more about the methodology Agency Spotter uses to rank agencies or check out more of their top reports. A B2B ratings and review marketplace and SaaS provider, Agency Spotter connects marketing decision-makers with top marketing agencies across advertising, design, digital, and 40 other marketing services. Agency Spotter makes it easy for any professional, from small business owner to CMO of a global enterprise, to take their marketing agency search from months to minutes. Agency Spotter's website and iPhone app help users navigate the agency landscape. They are easy to use and provide deep agency information, like verified client reviews and project work, to help thousands build agency shortlists and select agency partners. Visit www.agencyspotter.com.